Among the many names of old families, which turn up again and again in every type of village record, probably, the oldest that has survived until the present is that of Spafford, spelt in other forms as Spaforthe, Spaford, etc. In the mid-sixteenth century there was a long lawsuit about land at Wynthorpe belonging to the Spaforthe family, John Spaforthe having committed suicide in a well at Wynthorpe. The name of Spafford appears in 1699 in the parish register and regularly afterwards, through the eighteenth and nineteenth centuries. "Spafford's Marsh" is marked on the enclosure map of 1775 as the field on the left of Holme Lane through which the stream flows. There is no one of that name living in the village at present, but Mrs. A.E. 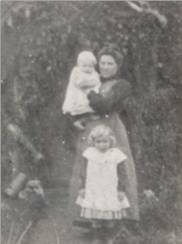 Kingdon (nee Spafford) who now lives in Langford, was born in Winthorpe at the Bleach Houses and lived in Winthorpe until she was twelve years old. Her father and her grand­father were blacksmiths at Winthorpe and had blacksmith-shops also at Langford and Holme, and for a long way back the men-folk of the family have been wheelwrights or blacksmiths. Mrs. Kingdon has in her possession a most interesting family record, compiled by a cousin of her father's. It is not a completely connected family tree, as some links are missing, but the earliest date is 1425, and a considerable number of Spaffords lived in Winthorpe itself, as well as in neighbouring villages. Parish records here, as elsewhere, suggest that in the past people moved about the country more than is generally supposed, but usually the nucleus of an old family remains somewhere close to the native village. In Tudor times, when cases of morality were brought before ecclesiastical rather than civil authorities, a man from Winthorpe was tried by the Commissioners at the Visitation of 1559. "It was detected that Edward Baker, of Wynthorpe, husbandman of the said diocese of York, lived in adultery with a certain Margaret Brewer. Whereupon the man called to judgement and charged with his crime, confessed. And the aforesaid Lords Commissaries enjoined upon him a first public appearance in the market place of Newark on Wednesday next with bare feet and head, in linen or woollen clothes. And in like manner in the parish church of Newarke on the Sunday next following at the time of Divine Service. And that plainly and distinctly openly and publicly he shall declare the contents in a schedule to him delivered, and containing the deed aforesaid." At a court case at Newark in July 1710, nearer to our own time, an indictment stated that "Wm. Vasin of Winthorpe Inholder, from his birth to the date of the finding of this Inquisition has been of good name, a man of honesty and probity, and for the same was very much esteemed by his neighbours, and gained thereby custome to his house, and not only was in Repute and creditt with his neighbours but also with drivers passengers and travellers, who for some reason used and ffrequented his house as an Inne. But one Richard Anderson of Winthorpe craftyly maliciously and subtly designing to defame disgrace and bring into ignominy and bad repute the said William Vasin and to destroy his business and trade of Inkeeper and credit amongst his neighbours, on the 1st July 1710, discoursing with several liege subjects of the Queen concerning the said William Vasin, did openly and publicly say and declare in the hearing of several, these very English words, viz: "William Vasin is a highwayman. He has robbed me and one hundred more," by reason of which words, the said William Vasin being supposed to be such a person as affirmed and declared by the said Richard Anderson, hath lost his trade of Inholder and his neighbours withdraw from his company by reason thereof, and he is lessened in his credit very much." The Grand Jury returned a true bill. Anderson pleaded not guilty and was bound over with sureties to appear at the next Sessions. We do not know the final outcome of this case, but the name of Vasin (Vason, Vazin in alternative spellings) appears frequently in parish records throughout the eighteenth century and well into the nineteenth century. The church register has ten or twelve references through the eighteenth century, "Vazin's Homestead" appears in the Enclosure Map of 1775 at the corner of Hargon Lane. Vason was the first schoolmaster of the charity school mentioned by name in the Brewer's Charity accounts in the early nineteenth century, and later a Widow Vason was herself in receipt of the charity. Then they disappear from village records. The eighteenth century, as the Rev. Clement Griffith has noted, produced records of small property-owners who sold to Dr. Robert Taylor when he was building up his estate; as well as members of his own family villagers like Eyre, Duller, Hool, Skelton were involved, all well-known names which crop up again in the Enclosure award and also in parish registers and other village records. There are, however, three names of more than casual interest :- Rastal, Heron and Wilson. The church register records the marriage in 1733 of "William Pocklington and Elizabeth Rastal," these were the parents of Roger Pocklington who was later to buy the Winthorpe Hall estate after the death of Dr. Taylor. Much has been written elsewhere in the scrapbook about the Pocklington family and their connection with Collingham, where the Pocklingtons had been long established and highly respected. (One of them, William Pocklington, a Justice of the Peace, was one of those gentry of the county who signed a protest in 1642 against the ill will shown by Parliament to the King.) However, it is the name of "Rastal" or Rastall, which is interesting, too. This was also an old and prominent family in Collingham and also in Newark. An ancestor of the Collingham Rastalls, named John Rastall, married the sister of Sir Thomas More, and descendants were property owners in Collingham until the middle of the nineteenth century. Lack of time has prevented us from tracking the relationships of the Rastall family through the Collingham registers: that may prove a fruitful source for study. It suffices here only to add that in 1773 the Rev. Samuel Rastall was rector of Winthorpe; he resigned while the enclosure commission was working here, and the Rev. William Rastall became rector in 1778. He was rector for over thirty years and was succeeded by the Rev. Robert Rastall in 1818. The Rev. Robert resigned in 1836, which terminated a spell of over sixty years during which the Rastall family had been incumbents in Winthorpe, and for some of the time patrons too. William Rastall was a noted local historian, writing of the antiquities of Newark and Southwell. He was dissatisfied with some of the inaccuracies of his early public­ations and revised them in later editions of his works, which appear above the name of William Rastall Dickinson or William Dickinson. He changed his name after inheriting money from a relative whose name he adopted. It should be profitable also to study the ramifications of the influential Heron family, prominent in Newark and district during the seventeenth and eighteenth centuries and longer. Thomas Heron was Rector of Winthorpe from 1711 to 1719, and the family certainly owned property in the village. Dr. Robert Taylor's first wife was Ann Heron (they were married at Winthorpe in November 1739. The name "Heron" is wrongly transcribed as "Fern" in the printed copy of the marriage register.) One of Dr. Taylor's early property deals in Winthorpe concerned his brother-in-law Robert Heron's holding, and there was a proviso in the deal which was to ensure that the property should revert to the Herons if Dr. Taylor had no heir. As we have seen, this proviso came to nothing when Dr. Taylor married a second time. The Heron family seems inextricably interwoven with other prosperous local families, and the Thomas Heron who was one-time Recorder of Newark and an extremely wealthy landowner in Stubton and in Kent, (he was born in 1723 and died in 1794) had a sister Elizabeth who married a Rastall. Her son was called Samuel and became a clergyman, perhaps the same who was Rector of Winthorpe from 1773-1778 when he resigned. Certainly the Rev. William Rastall, who became incumbent in 1778, is mentioned in a Heron letter in 1760 and a foot-note describes him as a nephew (great-nephew?) of Thomas Heron, and Rector of Winthorpe. However, the frequent use in different generations of the Heron and Rastall families of the names Thomas, Robert, Elizabeth and Samuel makes positive identification difficult without a detailed study. It may be imagined that Winthorpe was only a minor interest to him and that during his years as absentee rector the affairs of the parish were carried on by the parishioners and churchwardens whose names appear in village records. The names of Fisher and Homer recur throughout the eighteenth century in the church registers and both were names of churchwardens and overseers, as was also Moriey. "1723 John Davinson and Elizabeth Hanla (Handley?) 11 Feb.
1734 John Polman and Ann Handlah (Handley) both of Newark." These are isolated references and we have no proof that the family is the same one. It is in the nineteenth century that the Handley family became closely connected with Winthorpe, when John Handley became patron of the living in 1836, following the Rastalls. As will be seen from the account of All Saints' Church, the Handleys were prominent in Muskham and in Newark, where William Farnsworth Handley was Member of Parliament and a magistrate during the mid-nineteenth century. His Newark home was Handley House in Northgate (now the offices of the Regent Oil Company). William Beech whose racy memoirs of Newark and its personalities in the middle years of the nineteenth century have been seen in manuscript form, speaks of the connection between Mr. W.F. Handley and the Rev. William Handley who was Rector of Winthorpe - "Handley House, where Mr. W.F. Handley resided until he died. He was a good old English gentleman who kept his hunters and a lot of servants in livery, which was claret coloured cloth, crimson collars, cuffs and waistcoat, black velvet breeches. He used to keep and find hunters for his nephew William Handley of Winthorpe until he married a governess at the Hall. He then got out of favour. He also purchased the living of Winthorpe for him of the Robert Rastalls." It was another member of the family, Edward Handley, who became rector in 1886 and built the present church as a memorial to his parents. Many of the Handleys are buried in the church. The name of Camamile has already appeared many times in the Scrap-book and it is an old village family which only disappeared from Winthorpe during the nineteen-sixties. The name does not appear in the existing church registers before 1785, with the record of the marriage of James Camamile and Lucy Gray, but from that time on the family became closely involved in village life. The men seem always to have been carpenters, wheelwrights or joiners, and the eldest boy in each generation was called Joseph and the second usually James. They were good churchmen and often held office, in different gener­ations, as churchwardens or as parish clerk or sexton, and in view of the family trade, there are in the parish records many bills, receipts and other documents bearing the name Camamile, in many variations of spelling, references to repairs of the pinfold, the wash-dyke bridge, wood-work in the church, etc. At one time, the wheel-wright's shop was in Hargon Lane, beyond Mrs. Ward's house, but the last Mr. Camamile to be the village carpenter lived in Wheatley House, where Dr. Jeffries now lives. There are many Camamile gravestones in the church-yard, and many also of the Gamble family who flourished in Winthorpe from the early nineteenth century. During the later years of the nineteenth century and well into the twentieth century, village life was dominated by the "big houses" and in particular by the families of the Gilstraps and Branstons who occupied them and played such a prominent part in every aspect of village and church life, as school-managers, chairmen of the parish meeting, church­wardens, helpers with Sunday schools, Mothers' Union and various church clubs, providers of "treats" for children and grown-ups and, in general, generous if sometimes slightly autocratic organisers of village social events. As a result of the concentration of many small properties into one large one in the eighteenth century, Winthorpe had become less and less a village of independent farmers, so that when the Hall estate began to be broken up in the mid-nineteenth century, the village was still mainly a residential one, split up among a handful of owners of big houses upon whom the villagers largely depended for their employment, whether as agricultural labourers or as indoor and outdoor servants. The 1831 census figures show that at that date there were 39 out of the 50 families chiefly employed in agriculture, that there were 3 male servants under 20 years of age and 14 female servants under 20, the older servants not being specified. When Mr. Bob Humphries (who will be ninety-nine years old this year, 1971) came to Winthorpe in 1907, there were 52 people employed in the village as indoor or outdoor servants alone, without counting the farm labourers. Wages were low and even the smaller houses had two or three servants and the big ones as many as ten or twelve. Mr. Humphries can still list them, as well as the names of most of them; he came with Captain and Mrs. Need as horseman. He worked from 6 a.m. to 10 p.m. for £1 a week and his cottage in the stable yard, and the two men and a boy who later worked under him (when the Hall stabled up to twelve horses) earned 18/-, 14/- and 12/- a week respectively. During the latter part of the nineteenth century, and probably until the first world war and after, the village was a close-knit community, self-sufficient in many ways, and although some of the chief residents opposed the opening of shops, a few shops evidently existed from time to time, the little bakery for instance, and occasionally the sub-postmaster seems to have had a shop as well, according to the directories. The shoemaker, dressmaker, etc. may have worked from their own homes; the Cawthan family, described as tailors, had in the eighteen-seventies a little shop in what was left of Thomas Brewer's White House. The blacksmith, wheelwright and carpenter had their own workshops, of course. After the sale of Winthorpe Hall estate in 1867, Mr. George Thomas Duncombe became the owner-occupier and probably the longest continuous owner-occupier since the time of Roger Pocklington. His branch of the Duncombe family came from Copgrove (where there are in the church several tombs and memorials), but it will be remembered that a Duncombe had in the past been owner of Winthorpe Hall, as George Slingsby Duncombe had bought the property on the failure of Roger Pocklington in 1809. Miss Mildred Duncombe Bindley, a grand-daughter of G.T. Duncombe, who lives in Somerset, has kindly undertaken to work out the relationship between the earlier and the later Mr. Duncombes, but they were certainly of the same family, and all of her grand-father's children were christened "Slingsby" after their first names. Her grandfather married an heiress named Arabella Georgiana Pierce and some time later took the name of Pierce-Duncombe, by which name her great-nephew, the present representative of the family is known. He has in his possession among the family portraits one of Slingsby Duncombe dated 1820. Mr. G.T. Pierce-Duncombe had eleven children of whom seven were daughters, and although Miss Bindley never visited the Hall as a child, as she lived abroad, her mother remembered it with great affection and described it to her in much detail. Such a large family must have contributed a lively element to social life in the village, and Mr. Pierce-Duncombe is often recorded as lending his garden for festivities of a general kind, particularly connected with the church - "Parochial Harvest Gathering and Tea in the Hall Gardens" we read in 1900, when "there sat down 120 to an excellent tea. The gathering was a great success; the grounds looked lovely in the beautiful weather, and games ancient and modern were spiritedly engaged in by old and young." During these years the village largely-made its own entertainment all the year round, sometimes a national event, like Queen Victoria's Diamond Jubilee, or the Coronation of Edward V11 was the reason, but there were also the regular village concerts, dances and whist drives in the winter, or Winthorpe Village Feast in June. "The programme was long and varied and the weather lovely. The Sutton-on-Trent Brass Band commenced proceedings by playing round Winthorpe till the Cricket Field was reached, and continued their music with intervals for nourishment till 10.30. First came the comic costume cricket match. Onlookers marvelled at the wit and dresses of the gamesters. Top hats got very much wounded and the game ignored science and rule, a likely result when played by male ladies, clowns and comic cuts. Then came sports for young and old vigorously competed. At 4 p.m. 55 children under 14 were provided with an excellent tea in the marquee, and at 5 p.m. over 140 adults sat down to a plentiful meat tea (with beer for the drinkers) all supplied by Mr. T. Watkin. After this repast came the singing of a Jubilee Song by the children, more sports and bicycle competitions, and then the prizes were presented by Mrs. Maryland amid much cheering, and followed by "God Save the Queen." Then the children scrambled for biscuits, nuts and sweets till their pockets were full, and were regaled with buns and milk. Meantime there were games of many kinds and dancing on the grass to the strains of the band. Towards 9 p.m. came the Bicycle Lantern Parade, slightly delayed, but a grand show combining art and ingenuity and much fitting up of old cycle relics. Last of all came a capital display of fireworks and coloured lights amid the trees, beautiful to behold. And so the day ended." "Rope Quoits,Single Women over 18. Women's Bicycle Threading Needle Competition. Men's German Race, and Boys' German Race. Winthorpe Feast was always held towards the end of June. Traditionally these ancient village festivals were held to celebrate the saint's day of the local church, but where the Patronal Day came in winter time (as in the case of Winthorpe, All Saints' Day, November 1st) it had long been the custom to choose a summer date for the out-of-door wake, fair and festivities, and although the church connection was retained, the winter patronal service was in the church alone. It is not known how far back these celebrations date. Winthorpe records do not mention them before the eighteen-eighties when there are references to the Feast in school logbooks, a half-holiday at least being usually granted on the day. "On Sunday morning the Band (Abbott's Silver Band) assembled on the green and played previous to a Church Parade. In church for the last two hymns the organ was dispensed with and the full Band of 25 performers accompanied. The result was splendidly sonorous." (so much so that it is noticeable that in later years when the band assisted, the service was held outside the church.) In the evening the Band again visited the village and as in former years after service played to a large concourse of people on the Village Green. On Monday, June 29th, appeared a caravan with the equipment of a small fair, of stalls, swing-boats, a merry-go-round and coconut shies, all sadly needing a refreshing coat of bright paint, but none-the-less enjoyed for all that. In the afternoon there was a cricket match between Winthorpe and Langford. In the evening Abbott's Silver Band came to the ground and played dance music till 9.30, charging a small entrance fee. Afterwards the fair was patronised to a late hour." The village feast went on being celebrated between the wars until the outbreak of World War 11 when it disappeared. Most of the older residents who were in the village at the time remember it as taking the same form year after year, although sometimes it seems to have been a much bigger affair, with stalls overflowing into Holme Lane or "donkey rides by the dyke-side." Miss K. Euston recalls one village feast when some actors (she thinks they were from Newark) came and performed a short play on the village green in front of the Lord Nelson. Another very early recollection of Miss Euston's, unrelated to the village feast, is of summers visiting the Hall; she remembers figures with blackened faces and someone beating one of them with a balloon on a stick. Her drawings of "characters" of Winthorpe; whom she remembers from her child­hood, accompany this article, and many other residents in the village have recalled them too, and there were more besides. A number of reminiscences refer to Captain and Mrs. Need, both unusually tall and both keen riders to hounds. (They hunted with the Belvoir.) They did not do much local entertaining but held frequent shooting parties when guests came to stay. In addition to shooting on the estate, Captain Need had some shooting at Aubourn, where Mr. George Scott was keeper. Captain and Mrs. Need were the first in Winthorpe to have a car, and in 1908 Mr. Bob Humphries' duties were extended to include work as chauffeur as well as groom. The car was a French Berliet, with carbide lamps, and it had to be kept immaculately clean. It was washed down after every trip, even if it had been only as far as the station in Newark, and every Saturday morning the wheels were changed from the back to the front. Mrs. Need would often come down wearing white gloves and would run a finger under one of the front mudguards; If the glove showed any mark, the car had to go back to be cleaned. Miss Josephine Gilstrap and members of the Branston family were indefatigable in their efforts for the village. The school log books of the time record how often they called at the school to look at the children's work or to hear them sing or recite. They lent their gardens for fêtes in the summer, gave support to the cricket club, helped to produce entertain­ments in the Village Hall during the winter months, or were active members of the parish meeting. In the early years of this century one of the most important moves to improve life for everyone in the village was the establishment of a proper drainage system, and after this was accomplished we hear less and less of the fevers and sore throats that had sometimes reached epidemic prop­ortions. "The storm of Wednesday afternoon last raged at Newark with astonishing violence. The hailstones were of enormous size, some of them weighing 4 oz. each and measuring 6 in. in circumference. Thousands of panes of glass were broken. But the most striking part of the phenomena was a tornado, which seemed to commence a few miles south-east of the town, and extended as far as the plan­tation of Mr. Grosvenor Hodgkinson M.P. in the village of Winthorpe, about two miles north-west of Newark. The desolation it has caused at Coddington in particular baffles description. The farmstead of a person named Daybell on the Coddington-Hill was reduced almost to a heap of ruins. The hurricane continued its devastating course direct to Winthorpe, carrying away seven or eight tons of straw from a farm yard, and damaging the buildings. At Winthorpe it seemed to renew its fury, and tore up numbers of large trees as though they had been goose­berry bushes. One clump of five large elm trees, close together, were dragged up by the roots without being separated. The whole was the work of a few seconds. The smell of sulphur when the tornado had passed was almost insufferable. Very little livestock was killed. It is remarkable that the cattle in the fields exhibited the greatest terror before the wind approached, in the manner described by travellers in tropical countries." This was indeed exceptional, but parish magazines often report on the effects of rainy summers on the harvest. August 1903 was particularly bad. "August has been a month of deluging rain, rank weeds and sodden fields. Farmers of ripest years gloomily tell of the like in I860." The village remained comparatively unaltered even between the wars. There was no electricity, and for most people, shopping in Newark meant walking or cycling in on market days. The Wednesday market was much as it is today, except that countrywomen set in the butter-market area of the Town Hall, selling chickens and butter, eggs and cream. The Saturday market was at its liveliest in the evening, staying open until nine o'clock or later, and it included quack doctors selling medicines, and fortune-tellers, trick salesmen of watches, entertainers and quick-fire auctions of anything from rolls of linoleum to pots and pens - all in the flickering light of naphtha flares. The village post office in the twenties was run by the two Miss Warings, Hannah and Liza, but the post office has been operated from several different houses in the village; the Miss Warings lived in the cottage (now two) where Mrs. Lovell lives, and it was a sub-post office only. The present office, run by Mrs. M. Mumby and Mrs. R. White still uses a "Winthorpe" rubber-stamp, but it is also one of the two flourishing shops in the village. At the beginning of the twenties there was only the occasional carrier passing through the village and a man with a cart travelled round selling paraffin. Mr. Hickman of Collingham, Mr. Hopkinson of Besthorpe and Mr. Talbot of Swinderby ran a carrier service on market-days, either Wednesday or Saturday or both; they picked up parcels or passengers any­where en route, but the journey in consequence took a very long time. However, in 1922 a private motorbus service was started, later to be sold to the Silver Queen service, which was in turn taken over by the Lincs. Road Car Company. Mrs. Mumby recalls that the bus fare to Newark was at first four pence; it is now 1s-7d or eight new pence (1971), although the distance, because of the by-pass, is greater. According to the Newark R.D.C., the Newark Corporation Water Act of 1891 gave the R.D.C. authority to supply water to Winthorpe, and there is evidence that water rates were being paid in 1901. Gas came to the village in the twenties, and electricity in the early thirties street lamps were added in the mid-sixties. It was World War 11, which marked the end of the old life in the village, and during the last twenty odd years there have been many changes and shifts in population. The construction of the airfield in 1940 was one major change in the village, and the building of the Newark by-pass (which is described elsewhere) had an even greater affect on life in Winthorpe. Until just after World War 11 there were still horses used for ploughing on farms in the village. Farming was renewed on part of the airfield when the Ministry relinquished it, and the remainder is now the permanent site for the Newark and Notts. Agricultural Show. There are two other farms in the village still, but in the main the people who live here no longer earn their living in the village. Most are commuters, business or professional people who work in Newark, although some travel as far as Lincoln or Grantham. The greater mobility, which the motorcar brought, has meant that people can find entertainment and relaxation away from the village. Nevertheless, the nucleus of older residents, together with the many newcomers who really enjoy village life, ensures that there is still a real sense of community, fostered by all the groups who meet in the village hall, on the cricket and football fields and tennis courts, and by all the villagers who regularly drop in for a chat and a drink at "The Nelson," the hub of democratic social life for two hundred years or more. Parish registers, churchwarden's records, parish magazines, county directories and recollections of Miss M. Buncombe Bindley, Mrs. A.E. Kingdon, Mrs. A. Hickman, Mrs. M. Mumby, Mrs, C. Morgan, Miss K. Euston, Mr. and Mrs. Coupland, Mr. Bob Humphries, Mr. H.W. Euston. Some of the Christian names recorded in the registers between 1687 and 1808. 1746 Jane Billby, stranger, buried December 6. 1750 Elizabeth Turton, a stranger March 3. *killed by the Falling of a Wall upon Him. 1774 Joshua Bett of Cotham, Waterman, drown'd June 1st. 1778 Ann Huson, Wife of James Huson was drowned May 21 and buried May 22nd. 1801 Thomas Elliott a Stranger Drowned March 17th. Three moving letters of 1781 from among the papers of the Overseer of the Poorof the Parish of Winthorpe, concerning Sarah Hazard of Winthorpe, who was staying with her married sister Mary Davis in Nottingham when both of them were taken ill "with the Fever that rages strongly in Nottingham" (typhoid? ), and closing with a letter from William Davis to his mother-in-law Mary Hazard in Winthorpe. The Hazard family (Hasard, Hashard, Hazzard) is represented in the church registers from 1745 to 1805 or beyond and in charity accounts of about the same period. Moved by the common ties of Humanity, I consider it a duty strictly incumbent on me to address you on behalf of Sarah Hazard, spinster, and to make you acquainted with her situation, so far as I am able to describe it. It is now sixteen Days since she was taken with the Fever that now rages strongly in Nottingham; when one of my Neighbours (of whom Mary Hazard that was, now M. Davis had a Room) was prevailed upon to take her in, for the conveniency of her Sister giving her such Assistance as was in her power; but alas: that temporary relief was short indeed; the said Mary Davis being also taken ill and now lies dead in the House. Sarah Hazard still continues in a very dangerous situation, having remained insensible since last Sunday but one; and notwithstanding the voluntary and Christian like Contributions of the Neighbours, I cannot conceive how she can be any longer supported, unless you send her some relief: the which I hope you will not fail to do (unless the Hearts of your Parishioners are as obdurate as Stone) with the utmost Despatch for there is no possibility of removing her at present. I most earnestly recommend that her mother come not to see her; as it may be productive of dangerous Consequences. Sir, I cannot deny myself the satisfaction of returning you thanks for the personal Favours and Kindnesses shewed towards me when Joseph Vessy was apprentice with you: of whom I sometimes called, in my Way to Morton. I recd yours of the 30th ult. and proceeded according to your Direction therein: and though with much Difficulty and some abuse, for taking the before spoken of Sarah. Hazard into my House. I got five Shillings of our Parish Officers for her present Relief, I thought it necessary to acquaint you with the same; hoping to meet with your further Advice and Assistance if it should become needful in this matter. - The young Woman still continues in the same State as before, having been deprived of her Reason a full Fortnight; and so unable to assist herself that we are obliged to have one Person stay with her always, and two sitters up every Night. Indeed the Overseers seemed to intimate that we might have a Woman from the Workhouse to look after her; but as those kind of Persons are seldom of any essential Service we have hitherto done without. - The Doctor who attends her is of Opinion she may continue a Day or two longer, but there is no probability of her Recovery. This comes with my Duty to you hopeing it will find you in good health as I am present thank god for it but is very sory to let you know that your Daughter Sarah Departed this Live about five o'clock this Morning and Mr. Johnson came to me to advise with me what was the best to do but the burial of my wife as run me to so much charge that I not being able to do anything in the affair. Mr. Johnson as undertaken to take all and pay all with the Help of the parish. Trades and Professions in Winthorpe in the nineteenth century, as recorded in some Nottingham­shire Directories. Here we list only those names, which are followed by mention of occupation. G.L. Beaumont, land-agent and valuer. John Cawthan , tailor & shopkeeper. James Allen, schoolmaster & sub-postmaster. Wm. Bacon, cottager and rate collector. R. Ironmonger, The Nelson and farmer. G.R. Levers, miller and farmer. Miss Anna Maria Drabble, dressmaker. G.R. Levers, farmer and miller. J. Pollard, bailiff to Mrs. Gilstrap. Wm. Shepherd, Hd. gardener at Hall. Geo. Stanley, Hd. gardener at Grange. Wm. Butterworth, threshing machine owner. Jos. Camamile, carpenter and parish clerk. Henry Ringrose, farmer, surveyor and churchwarden. Rev. J.C. Sewell, Inspector of Schools. John Owen Wardley, bank manager. Mrs. M. Watkin, baker and shopkeeper. "Cecil Harte, Bachelor, of Prestwood Bucks, and Anna Pia Livia Matilde Tersilla Palazzi, Spinster of this parish." John Spaforthe - 1561 in Volume 4.